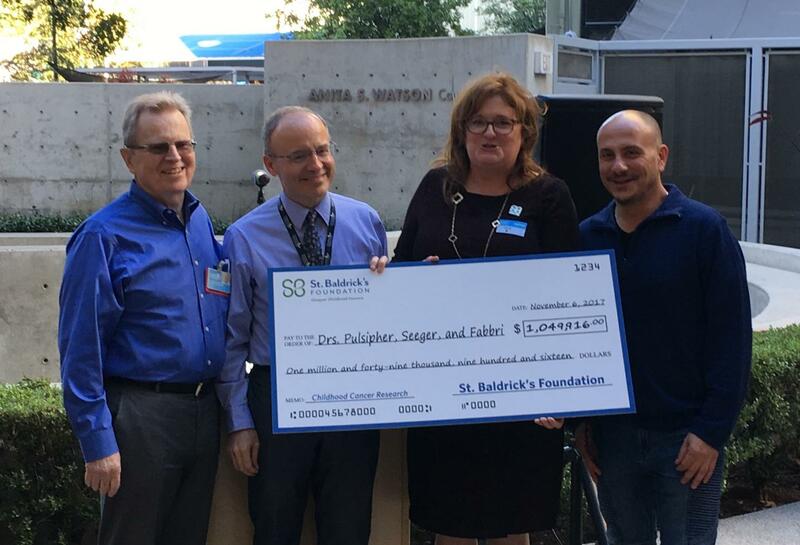 Three physician-researchers with the Children's Center for Cancer and Blood Diseases at Children's Hospital Los Angeles (CHLA) have been awarded more than $1 million in grants from the St. Baldrick's Foundation, the largest private funder of childhood cancer research. The funding will be used to support research efforts spanning both neuroblastoma and acute lymphoblastic leukemia – two of the most aggressive childhood cancers. Michael Pulsipher, MD, head of the Pediatric Blood and Marrow Transplant Consortium (PBMTC) headquartered at CHLA, has received continued support for ongoing work evaluating cellular and immunological approaches to prevent relapse in children diagnosed with acute lymphoblastic leukemia (ALL). Robert Seeger, MD, has received a St. Baldrick's consortium grant to support the New Approaches to Neuroblastoma (NANT) Consortium, headquartered at CHLA. The research, led by Seeger, seeks to enhance the immune system's ability to eliminate neuroblastoma by targeting both the cancer cells and surrounding cells that help the tumor cells grow and resist treatments. The work will enable the development of new therapies with the potential to improve survival in children with high-risk neuroblastoma, the second most common solid tumor in children. Muller Fabbri, MD, PhD, has been awarded a St. Baldrick's Scholar grant to investigate how genetics and immune cells affect the growth of neuroblastoma tumors. Fabbri is working on a new strategy to target immune cells that contribute to disease progression with a goal toward the development of more potent immunotherapies to improve the outcomes for children with this disease. "We're delighted to be able to support these talented and dedicated research investigators who are really getting to the heart of improving outcomes for children with ALL and neuroblastoma," said Kathleen Ruddy, chief executive officer for the St. Baldrick's Foundation. "Drs. Seeger, Pulsipher and Fabbri are discovering novel ways to make the patient's own immune system work better at fighting resistant cancers and that is nothing short of amazing." "St. Baldrick's continues to be an important partner in our cancer research program at CHLA and with their support, our team of investigators is ushering in a whole new era of cancer immunotherapy," said Alan S. Wayne, MD, director of the Children's Center for Cancer and Blood Diseases. "The foundation's support has helped our investigators conduct studies critical to obtain large federal grants from the National Cancer Institute and the National Institutes of Health, greatly enhancing the scope and impact of our childhood cancer research."